Guruji: “.. If that place appears so desolated today, can you imagine how would it have been a hundred years ago! In fact, there are a lot of such deserted places around Gwalior, discovered and inhabited by people who were seeking solitude. This reminds of an interesting experience I had at Amara mountain in Gwalior. “In our college days, me and a friend of mine used to leave home in the morning with lunch pack and a water bottle, and roam all day on the mountains to return home in the evening. The friend’s name was Padam Upaddhyaya. One of those days, we went climbing up the Amara mountain above the Gupteswara temple. We climbed for more than 3-4 hours straight. When it got too hot in the afternoon, we decided to climb down to go back home. There was a groove made by dried water stream climbing down the mountain to Tigara road so we decided to walk alongside that. By the way, we saw white crabs and small turtles in that area. Climbing down, we saw a small cave. It had Aum painted on the wall and a trident stuck in the ground outside. There was also a dhuni (sacred fire place) nearby which seemed to indicate there must have been a sadhu living in that cave, but we didn’t see anybody around. “Climbing further down, almost half-way down from where the road was also visible, we came across a small room – about 6×8 feet and made of stone blocks. Since we were very tired and were not in good spirits because of the heat, we decided to stop by and check it out. Looking inside the stone room, we saw a old man sitting cross-legged in one corner. He had a long white moustache and white beard, and his hair were twisted in a knot at the top. His hair and his beard were normal but his moustache was exceptionally long! And hee had really large eyes with which he was glaring at us. We were a little taken aback because of his appearance when we peered inside the room. But anyway, we sat down at the doorsteps and asked him: ‘Baba, can we have some water?’. There was a earthen pot in the room and a copper lota (tumbler) next to it.What he did next was interesting. You remember how beggars with their legs amputated move? He didn’t break his cross-legged position, but moved with the support of his hands to the water pot and fetched us water, all the while constantly glaring at us. After drinking water, we asked his leave but he gave absolutely no response except constantly glaring at us. We left and reached home at around 4pm in the evening. “Around 5 or 6 days later, the strangeness of the encounter struck us. I said, let’s go find him again. Starting that day, for almost about a month we kept trying to find that stone-room but were never able to. We found the groove on the mountain along which we had climbed down, the cave with aum and the trident, but the room made of stone blocks had simply disappeared! On the spot where the room was supposed to be, there was plain mountain and nothing else. We had taken bearing climbing down from the top and the path we had taken earlier was very clear as well, and we tried many times even going back and forth but there was no sign of the room. Guruji: “I’ve heard that as well. Mansingh built only a few portions of the fort though, what are now known as “Man Mandir” and “Gujari Mahal”. The rest of the fort is quite old. In fact, it is one of the oldest forts in India. By the way, the temple in the fort known as ‘Saas Bahu Mandir’ was originally “Sahastrabahu Mandir”. [Sahastrabahu, “the-thousand-armed” is a legendary figure in Hindu mythology. He is also known as Kartyavirya Arjuna]. Over time, the name Sahastrabahu got corrupted into Saas Bahu (Saas = mother-in-law, Bahu = daughter-in-law). “This book also claims that the current Gwalior is actually the old Goverdhan”. “That’s very interesting to know! People say that in Krishna’s times, Gwalior was a part of Vraj. The cow herders (Gwaley) used to own all this land, including Gwalior and nearby places like Gohad. These places used to belong to the cow herders of Vraj mandal. Even the mountains of Gwalior are known as Gopanchal mountains. ‘Gopanchal’ literally means a place where gop or cow herder lives. It is definitely possible. “Also see, there’s a place near Gwalior called “Jaurasi ka Daank” which is actually the place of spiritual austerities of the 84 Siddhas! 84 in Hindi is pronounced Churasi, from which the name Jaurasi came. Datia (a place near Gwalior) is associated with Lord Dattatreya. Its old name is Datteya. 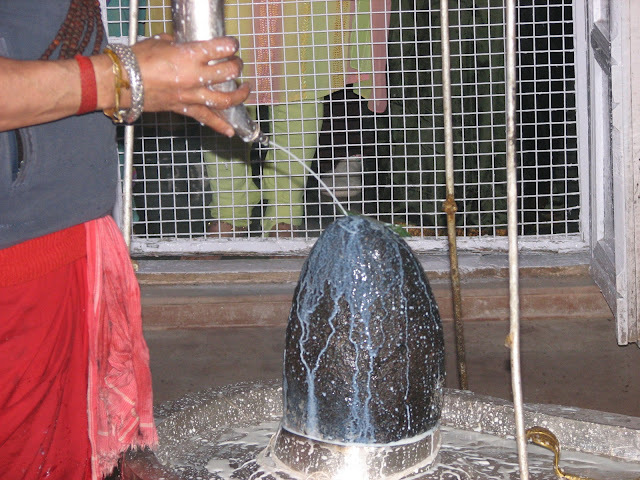 The temple of Lord Shiva there, Van Khandeswara Maharaj, is a very ancient temple. There’s a legend that Ashwatthama used to come and worship there. The place was later developed by Datia Swami. But it was already a siddha place. “Send me a copy of the book you are reading, it sounds very interesting. [“Gwalior” by Arthur Hugh, Vidya Mandir Publications].